I love going to dinner parties and bringing dessert. So of course every time I do I am looking for a new dessert to try, and most of the time I would prefer not to spend my entire day in the kitchen. For my most recent gathering I made a dessert that brought back some wonderful childhood memories in only a few hours. My great aunt was always celebrated in our family for her amazing cream puff-making skills (of course this was well before cream puffs were a trendy treat to make or eat! @BeardPapasNY). I remember the puffs being super light and fluffy, and filled with a smooth and delicious vanilla custard. Unfortunately I never got a chance to get that recipe from my aunt, so I set the bar pretty high for choosing another one. 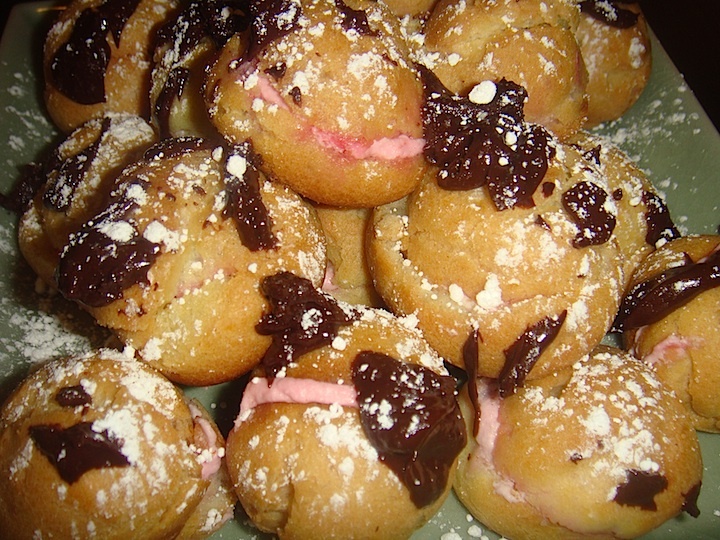 I ended up finding a unique recipe on the Food Network website that uses a non-traditional raspberry cream filling for miniature puffs. I then added my own decadent twist, a dark chocolate drizzle. 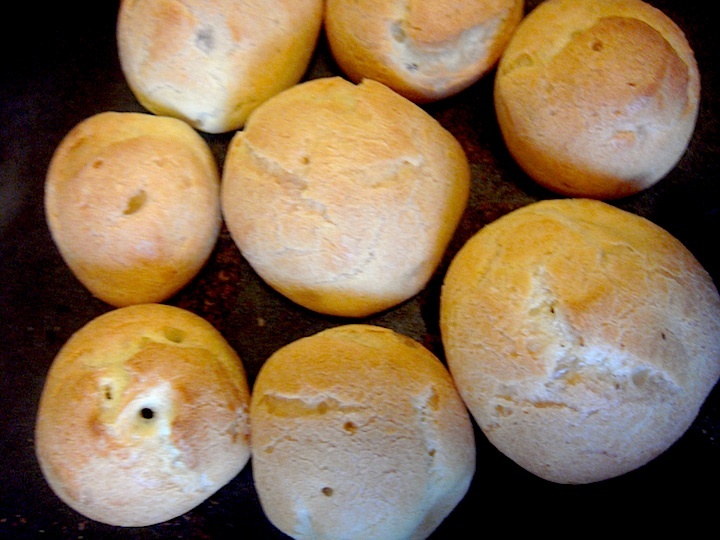 Below are some tips for making some great puffs! You are supposed to use an electric mixer with a paddle attachment. I just used a regular hand mixer on low which worked. 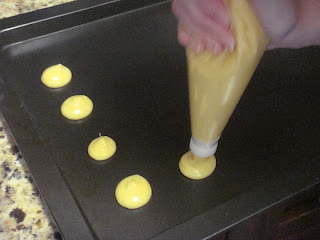 A pastry bag is also recommended for piping out the puff batter. However, you can always use a zip lock bag and cut off the tip if you don’t have a pastry bag. Draining raspberry seeds can be complicated without a sieve. I tried to use a cheese cloth, and then a strainer with a paper towel in it. 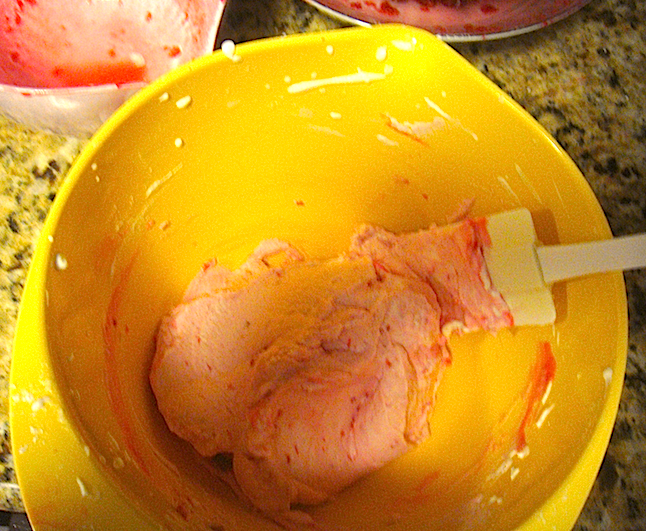 Basically I made a mess, but the cream still turned out well, and you could barely notice the extra seeds. These cream puffs do burn easily, so keep them on the top oven shelf and keep an eye on them. I burned my first batch and had to cut off the bottoms to make improvised cream puff-top sandwiches. Dark Chocolate Drizzle- You can really play around with this recipe to find a chocolate sauce that you love- that' s part of the fun! Heat half-and-half and sugar to a boil. Remove from heat. Whisk in chocolate until it melts. Add more sugar to taste. Drizzle over filled cream puffs while sauce is warm and sprinkle confectioners' sugar as a finishing touch. Hi everyone! It’s been a while since my last entry so I thought I would start out 2012 with a restaurant experience that promised to be over-the-top and delicious. This mission brought me to SALT & FAT in Sunnyside, Queens. It’s a charming little spot located on Queens Boulevard and 41st Street. The chef and owner is Daniel Yi, a Sunnyside native. 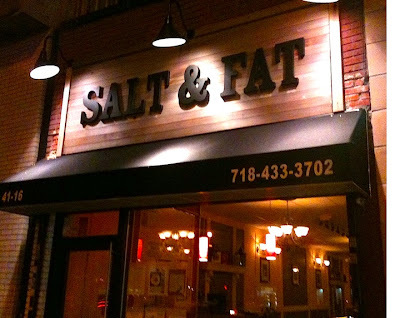 I received a preview of SALT & FAT’s inventive take on New American cuisine at the Taste of Sunnyside 2011, so I knew I was in for a real treat. 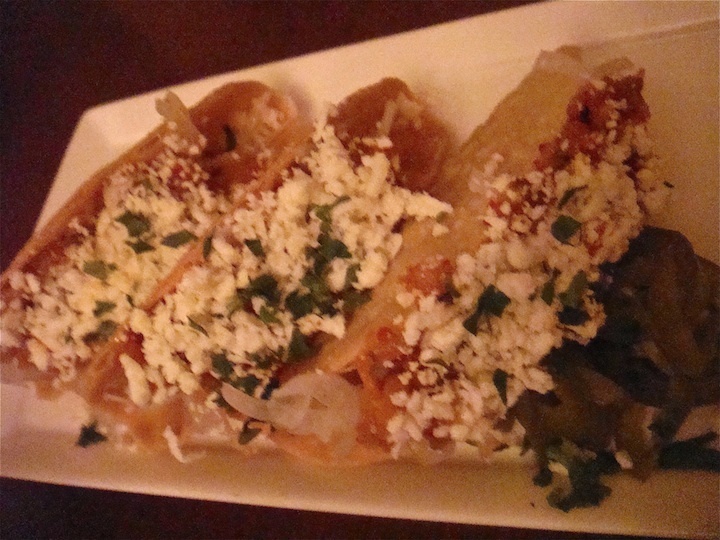 My meal started with braised pork belly tacos that were definitely my favorite dish of the night. The pork was very tender and the flavors from the pickled onions, kimchi salsa, and queso fresco really popped together. After the tacos, I shared the shrimp and grits and the fried chicken plates. 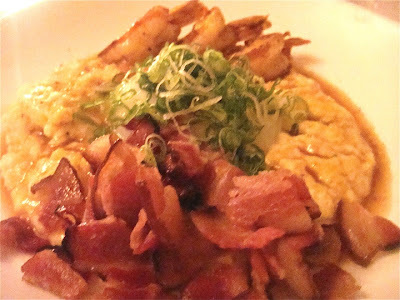 I loved the shrimp and bacon, but the grits were super creamy, especially when combined with the egg. Therefore, if you don’t like creamy dishes I would skip this one. My dining companion however loved the dish so much that he was basically licking the plate! 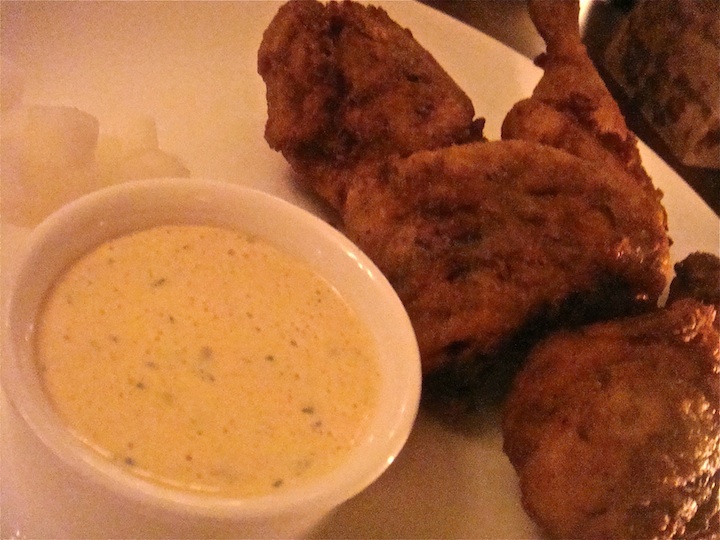 The fried chicken was cooked to perfection and a deep golden brown. I preferred my chicken straight up, without the herb ranch dipping sauce, and I couldn’t get enough of the pickled daikon on the side. That really balanced out the dish well. I have to emphasize that I was aiming to eat A LOT of salt and A LOT of fat on my trip, and I totally accomplished that. Of course sometimes getting what you want can be a bit overwhelming, so it's good to know that even though the restaurant website talks about small plates, not all small plates are created equal, and some dishes on the menu aren’t small at all! For example, the fried chicken was half of a chicken! Our server was more than happy to help us navigate the delicious menu choices. Hopefully next time I will save some room for dessert, because the Rice Krispies with marshmallow ice cream sounds amazing!